Topps will once again offer collectors some exclusive Garbage Pail Cards at this year’s San Diego Comic Con. SDCC is set to take place 7/20-7-24 at the San Diego Comvemtion Center. Similar to last year, Topps will offer offer two Jumbo 5 X 7 card sets. This year Topps will reuse artwork previously offered in online only sets. One set being offered will feature 10 presidential candidate cards. 5 cards will be of Democratic nominee Hillary Clinton, and 5 cards of Republician nominee Donald Trump. All cards were previously offered in regular card size in various online sets sold the past few months. 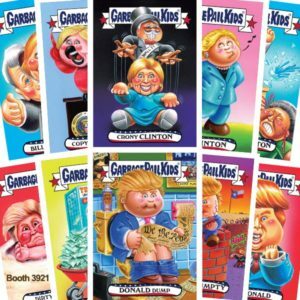 The entire 10 card set will cost $20 at the convention. The second set being offered is a 10 card Prime Slime Trashy TV promo set. This same set was previously offered in regular card size a few weeks ago via topps.com. The 10 card Trashy TV set will also cost $20 at the convention. Also like last year the sets will be sold at the Atomic Toybox booth (3921). No word yet on the print run for these jumbo SDCC sets. Thanks to GPK collector srezvan an for the heads up on the offering. For more information visit this link. This entry was posted in 2016 GPK Pie, 2016 Trashy TV, SDCC and tagged 2016 GPK Pie, 2016 Trashy TV, SSCC by Jeff. Bookmark the permalink.